are complete except for footnotes. The Oklahoma bombing exposed links between the Army and the militias. The miltias use Army training grounds, buy their surplus weapons, and share a militarist mindset. Donner's work, showing how right-wing paramilitary groups were previously encouraged by intelligence agencies and police, sheds light on the rise of the militia and Patriot movements. 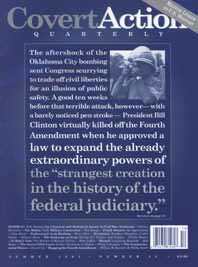 A stable of government officials, media, and terrorism experts filled the gap between the Oklahoma City bombing and the arrest of Timothy McVeigh with an explosive fertilizer of its own: insinuation, fear, and racism. While Japan was desperately trying to surrender, the U.S. knowing that the war could be ended without a land invasion dropped two A-bombs: the opening shot of the Cold War. The U.S. bullied the U.N. to extend the embargo. While the Iraqi people suffer, the U.S. rules the region and helps the Saudis maintain oil prices so that the pampered princes can buy U.S. arms and technology. As scandal grows over CIA involvement in Guatemala, a soldier jailed for killing a U.S. citizen once again tries to tell a story no one wants to hear. After creating the world's worst industrial disaster, Union Carbide has led the way in manipulating the legal system to protect the right of corporations to pollute and to endanger the public. Seven judges on a secret court have authorized all but one of over 7,500 requests to spy in the name of national security. They meet in secret, with no published orders, opinions, or public record. Those spied on may never know of the intrusion. Now, Clinton has expanded the powers to include not only electronic, but physical searches. Supposedly aimed at a foreign menace, Clinton's Omnibus Counterterrorism Bill threatens to strip immigrants of their rights, curtail citizens' freedoms, and turn international solidarity into terrorist activity. Now, the Republicans are trying to one-up the administration proposal. The Constitution's search and seizure restrictions keep the police in check. Now, Congress wants to make the Fourth unenforceable. Prepare to kiss the exclusionary rule goodbye.